Stila Magnificent Metals Glitter & Glow Liquid Eye Shadow ($24) is a new brilliant, liquid glitter eyeshadow formula that launched in eight shades with the Stila Spring 2017 Collection. There are days I tell myself that I’ve outgrown glittery, shimmery eyeshadows and I can happily live my life with a satins and mattes but something like Magnificent Metals Glitter & Glow Liquid Eyeshadow launches and I’m instantly drawn into purchasing them because OMG glitter! I mean who can resist all this glitter? Although I will say Stila made a major mistake launching these for Spring as they would have been perfect for the Holidays. The glitter captures the light so beautifully and it makes your eyes shine! Here’s my review and thoughts! Stila Magnificent Metals Glitter & Glow Liquid Eyeshadow (0.15 oz) comes in a square barrel with an attached sponge applicator for application. 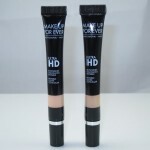 The packaging is simple, easy to store, and you can clearly see the shade in the clear barrel. The formula is a mix of chunky pearl and glitter particles that have a lightweight consistency which apply very, very easily. I think I expected a mess but what I got was a fairly smooth and easy blending process with absolutely no fall out. The formula blends easily on my drier lids and adheres well. It doesn’t set too quickly so it gives you plenty of time to blend and it doesn’t leave a sticky or tacky mess on my lids. But be warned, this is essentially a glitter eyeshadow which translates to loads and loads and loads of glitter. This isn’t for shimmer or glitter haters as we are talking heavy duty glitter bomb eyeshadow here. The bad news isn’t these aren’t exactly easy to wear in daily looks as I’m doubtful you’d slap this much glitter on your eyes and head out to work. However, it is a beautiful eye look for evenings out or celebrations which is why I mentioned above it would have a perfect Holiday release as these would look incredible in a New Year’s Eve look! One of the things I took note of was the fact Stila was very honest about fallout. In their details, they mention that these provide maximum sparkle with minimal fall out. That’s exactly right. This is sparkle to the max and the fall out is very, very little. I read a few reviews that said the formula had a good deal of fall out but I had no issues. Whether I wore primer or didn’t, I had very minimal fall out with a few stray glitter chunks that fell under my eyes and one little particle that somehow ended up on my forehead. Aside from that I had no issues! I also didn’t have problems with creasing. The formula locked on very well and didn’t move, migrate, or crease throughout the wear. I thought I’d have issues with removing the eyeshadow but that was also very easy and I didn’t have stray pieces of glitter in my eye or on my lid after cleansing. The formula was a easy to apply, easy to wear, and provided very dramatic sparkle. They actually work well all their own or should you like you can apply them over another cream or powder eyeshadow. All in all, Stila did a wonderful job with Magnificent Metals Glitter & Glow Liquid Eyeshadow. If you’re a sparkle girl or guy you’re bound to love them! Stila Magnificent Metals Glitter & Glow Liquid Eyeshadow are available now at stilacosmetics.com, sephora.com, and at ulta.com. Well, my glitter dreams have come true! I agree!! I will be 80 years old and still be wearing my glitter and not caring one bit what anyone says! Must pick up a few of these. You wouldn’t recommend glitter glue? I’m starting to wonder if that would help me with my issues and allow me to wear some of this stuff. I guess I won’t know until I give it a shot! Sorry to hear it! I didn’t use glitter glue, I just wore on bare lids or with primer. Worked fine 🙂 Glitter glue isn’t going to really help if you’re sensitive to shimmer/sparkle! I was drawn to these but I think I’ll pass. I’m not getting any younger and I don’t really go out in the evenings much anymore. Oh it is so pretty! My budget doesn’t allow for something so impractical but omg I want it. I can picture wearing it as glitter liner, layering over shadows as a sheer sparkle wash, or a concentrated pop of sparkle in the center of the lid. Thanks girly!! Will def check ’em out! This is a gorgeous shade and looks really beautiful on you Isabella. I’ve had my eyes on these for a while – soooo tempted to get one for my birthday!